Some people seem born with the natural ability to shrug things off. A woman who had a shocking little encounter with a shark is further proof of this. 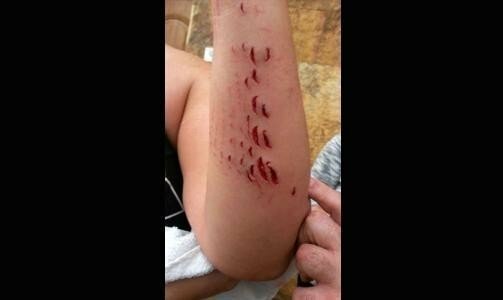 Cris Ojeda-Thies said she would have gotten right back in the water to swim, if it weren't for the bandage on her arm after a shark tried to, you know, eat it a little. "No alarmism please," she said, according to The Local. Ojeda-Thies recounted what happened for a local newspaper: She was swimming in waters just off the Canary Islands on Christmas, she "noticed something pulling at my left arm but I didn't pay any attention because it felt like a dog biting you when it's playing." "I returned to the shoreline swimming ... and I felt another pull again, more intense this time," she said. "It was a fish. I hit it with my right hand and I saw the shark's fins as it swam off." Ojeda-Thies calmly tweeted a picture from the clinic where she was treated for her bites, showing people snapping photos of her wounds. She even started the hashtag #CrisVsTiburón. "There are times when I've fallen off my bike or I've burnt myself cooking and it's hurt me more," Ojeda-Thies said. If the shark had really wanted to hurt her, he could have. But most of the time sharks are really just curious, and they nibble with their teeth to investigate. When The Dodo spoke with George Burgess, noted shark expert and director of the International Shark Attack File at the Florida Museum of Natural History, back in July about a separate incident, he explained what sharks generally have in mind when approaching people. Sharks are "obviously interested in the human," Burgess told The Dodo, but usually they do not want to eat anyone. And the facts confirm that there are other things in the world to worry about much more than shark attacks: You are more likely to die from lightning, fireworks and even sun exposure than a shark attack; your chance of being killed by a shark is about 1 in 3.7 million. A few days later, after being treated by the doctor, Ojeda-Thies is back to tweeting pictures of the sea. Learn more about what causes shark attacks here.